Eat Action Bronson Goes Full Guy Fieri in Episode 4 of "F*ck, That's Delicious"
Action Bronson Goes Full Guy Fieri in Episode 4 of "F*ck, That's Delicious"
Watch Bam Bam take New York, chowing on homemade baklava, a Milk Bar milkshake, Italian comfort food, and a Korean food/White Castle mashup. We knew that Bronsolino wouldn’t disappoint when he finally made a triumphant return to his home turf. 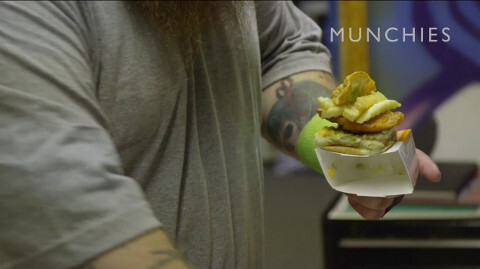 We’ve seen him eat at Marea and visit Eddie’s Sweet Shop in Forest Hills in the past, but in the latest episode of his Munchies show, he takes the time to dig a little deeper into his NYC food life—all while dressing up like a foul-mouthed, even fatter Guy Fieri. Sure enough, his aunt makes a gorgeous 60-layer baklava out of milk, eggs, walnuts, butter, sugar, cornstarch, corn oil, and flour. Equally beautiful? The childhood photos of Bronson we get to peep during the pastry’s five-hour baking time. After leaving Tosi with the massive baklava, it’s on to Queens’ Dani’s House of Pizza. Indulging in baked clams while his hand-tossed pie cooks in the oven, Bronson chats with the staff in Spanish and exclaims his love of the comfort food.